What is the Cell ADDRESS Function? The cell ADDRESS function is categorized under Lookup and Reference functionsFunctionsList of the most important Excel functions for financial analysts. This cheat sheet covers 100s of functions that are critical to know as an Excel analyst. It will provide a cell reference (it’s “address”) by taking the row number and column letter. The cell reference will be provided as a string of text. 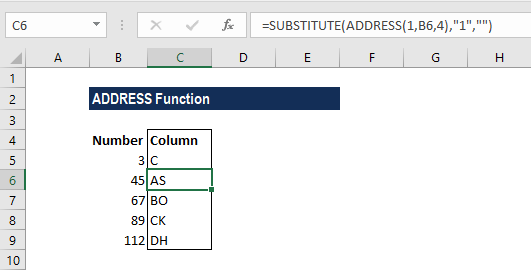 The function can return an address in a relative or absolute format and can be used to construct a cell reference inside a formula. As a financial analystFinancial Analyst Job DescriptionSee a real Financial Analyst Job Description including all the skills, experience, and education required to be the successful candidate for the job. Perform financial forecasting, reporting, and operational metrics tracking, analyze financial data, create financial models, cell ADDRESS can be used to convert a column number to a letter, and vice versa. We can use the function to address the first cell or last cell in a range. Row_num (required argument) – It is a numeric value specifying the row number to be used in the cell reference. 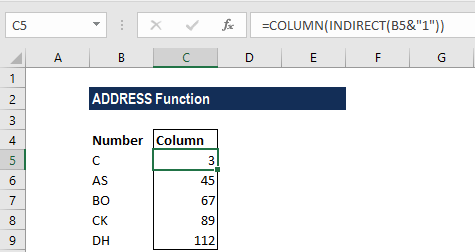 Column_num (required argument) – It is a numeric value specifying the column number to be used in the cell reference. 4. A1(optional argument) – It is a logical value specifying the A1 or R1C1 reference style. In R1C1 reference style, both columns and rows are labeled numerically. It can either be TRUE (reference should be A1) or FALSE (reference should be R1C1). When omitted, it will take on the default value TRUE (A1 style). Sheet_text (optional argument) – It specifies the sheet name. If we omit the argument, it will take the current worksheet. 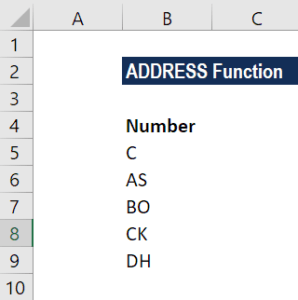 How to use the ADDRESS Function in Excel? The ADDRESS function will first construct an address containing the column number. It was done by providing 1 for row number, a column number from B6, and 4 for the abs_num argument. After that, we use SUBSTITUTE function to take out the number 1 and replace with “”. 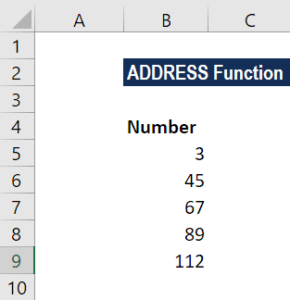 The ADDRESS function can be used to convert a column letter to a regular number, e.g., 21, 100, 126, etc. We can use a formula based on the INDIRECT and COLUMN functions. 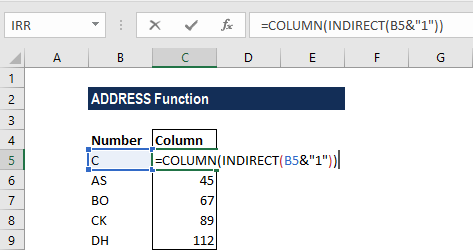 The INDIRECT function transforms the text into a proper Excel reference and hands the result off to the COLUMN function. Then, the COLUMN function evaluates the reference and returns the column number for the reference. If we wish to change the reference style that Excel uses, we should go to the File tab, click Options, and then select Formulas. Under Working with formulas, we can select or clear the R1C1 reference style checkbox. Any of the supplied row_num, column_num or [abs_num] arguments are non-numeric or the supplied [a1] argument is not recognized as a logical value.